My new 7 DAY DIET PLAN will help you reach your ideal weight, dramatically improve your health and gain energy naturally. This diet plan is different to any other diet you have ever done. Why? Because it incorporates my invention the Green Thickie which is a full meal Green Smoothie. Have you heard how green smoothies help you to easily eat more fruit and leafy green goodness? They do wonders for your health. I’ve been drinking them for years and they are my secret weapon to sustained weight loss and vibrant health. 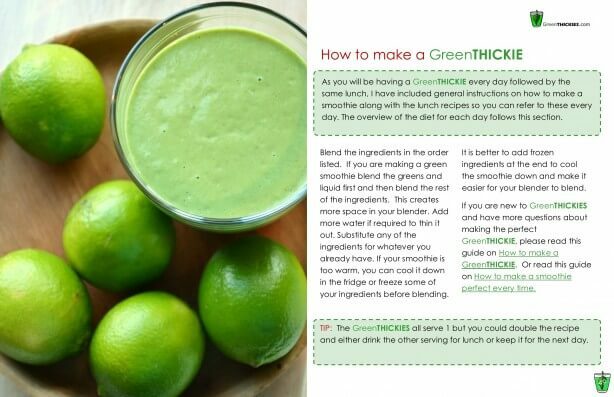 The Green Thickie is a meal replacement green smoothie which ensures you get enough energy to keep you going until your next meal. And since I started sharing my recipes with you, people keep asking me to help them figure out what else to eat for their other meals so they can lose weight too. I created the Green Thickie to help me lose my baby weight. And it worked. I wanted a healthy breakfast that was quick to make, and quick to eat as I was too busy to sit down for a proper breakfast after I had kids. 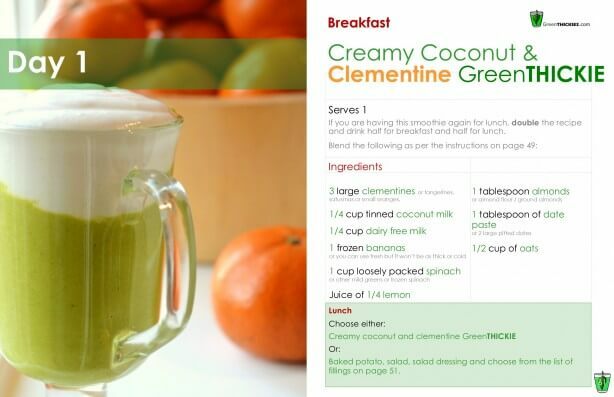 The Green Thickie is the perfect healthy meal for extremely busy people who are always on the go. So, now I have incorporated Green Thickies into a full diet plan to provide everything you need so you can also lose weight and improve your health while limiting the amount of time you spend in the kitchen. I am giving you a calorie counted healthy meal plan with full recipes, essential information, shopping lists and everything you need for the entire week. You don’t have to buy any supplements, products or speciality foods. This meal plan is all based around normal ingredients that you can buy at your local store. My diet is not only delicious, but it will also meet all your nutritional needs from easy to find foods. I made it better than anything else out there by providing you with my secrets for losing weight – and keeping the weight off after you have completed the diet. 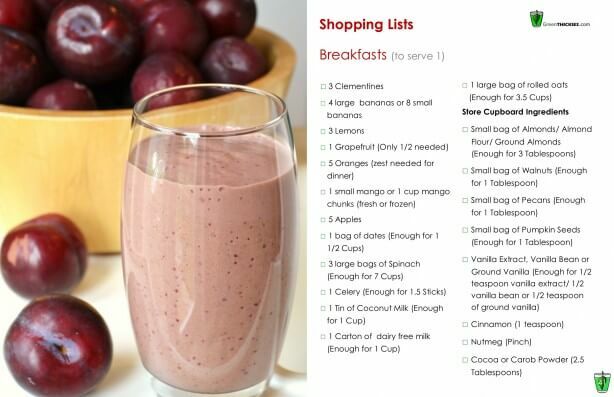 I give you easy templates for creating your own healthy meals that will help you to continue lose weight once the week is finished. I also share my strategies for staying motivated to lose weight in the long term. One of my core principles is to prepare meals in the easiest and healthiest way possible which is what makes my recipes so popular. I have applied the same principals to all meals in this book. 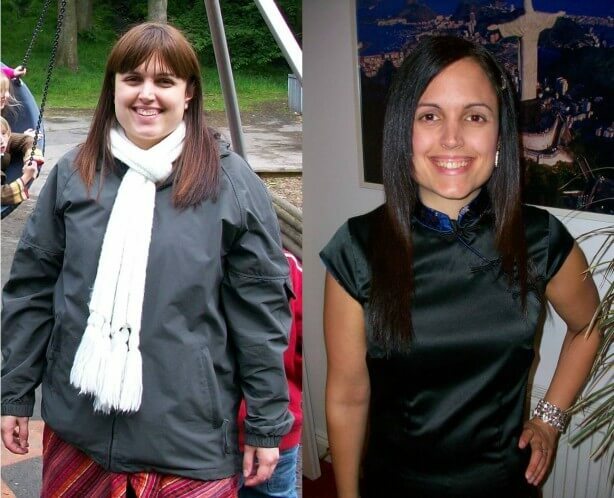 Average weight loss of 3.5lbs – and one person lost 11lbs! When you complete this diet plan you will be well on your way to creating a leaner, healthier and stronger body in a very short space of time. This is why you are getting so much value for money when you buy this ebook. I’m selling this book at such a reasonable price so that I can help as many people as possible to reach their ideal weight and regain their health. Get it today because there is never a better time to lose weight. Why put it off any longer than you absolutely have to. Every pound that you lose will give you more confidence and make you feel much better about reaching your goals. This ebook will take the guess work out of losing weight for you. 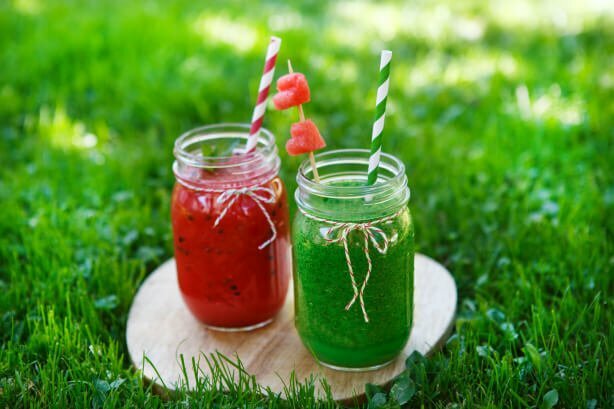 Now you can incorporate filling green smoothies into a diet plan that is proven to help you lose weight and make an immediate improvement on your health. How much money have you spent eating out in the past? You’ve paid a lot of money to put the weight on and now for a fraction of the cost of gaining the weight, you can follow the 7 DAY DIET PLAN and learn the secrets to consistent, healthy and convenient weight loss. Get a copy of this ebook, make some quick healthy meals, lose weight, gain energy and feel so much better about yourself TODAY. Note: Please remember that this is a paper saving full colour, beautifully designed 90 Page PDF E-book and NOT a Physical Book. It is designed to be used on your electronic devices such as PC, Laptop, Tablet, and Smart Phone. Printer friendly documents with the important information have been provided to save your paper. You can view this PDF on any PDF reader such as Adobe Acrobat. This ebook is available for immediate direct download via a link once you buy the product. 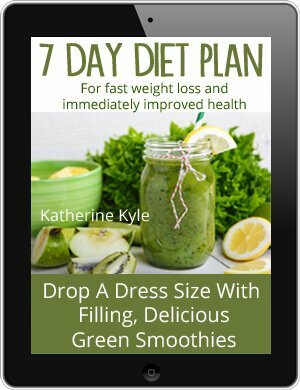 Buy now and begin the 7 DAY DIET PLAN that will start you on the road to recovery and wellness. Katherine Kyle is the founder of www.GreenTHICKIES.com and has turned her life around with the use of filling green smoothies and cleaner eating. 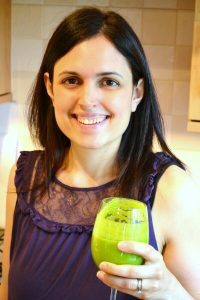 Katherine lost 56 pounds on a green smoothie diet, then lost her excess pregnancy weight after the birth of each of her children by following a Green Thickie diet. She overcame chronic fatigue syndrome and many other health problems and now leads a full life. Katherine is so passionate about the changes in her life that she wants to help you have the same success. Are you willing to make that change? Buy the Green Thickie 7 DAY DIET PLAN now for instant results. 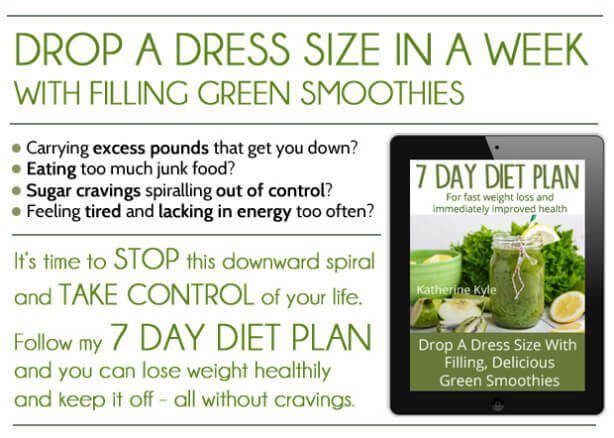 If you have any questions about Green Thickies 7 Day Diet Plan, please email Katherine at greenthickies@gmail.com.